In 2018, NYRR is celebrating 60 years of helping and inspiring people through running. Last month, we went back to the 1990s, a decade defined by emotional moments in Central Park and further evolution into a club that was “about more than running.” This month, we’re looking back at the 2000s, when NYRR’s growth reached new heights, with membership hitting 40,000 for the first time. With this growth came an expansion of influence on a local, national, and international scale. 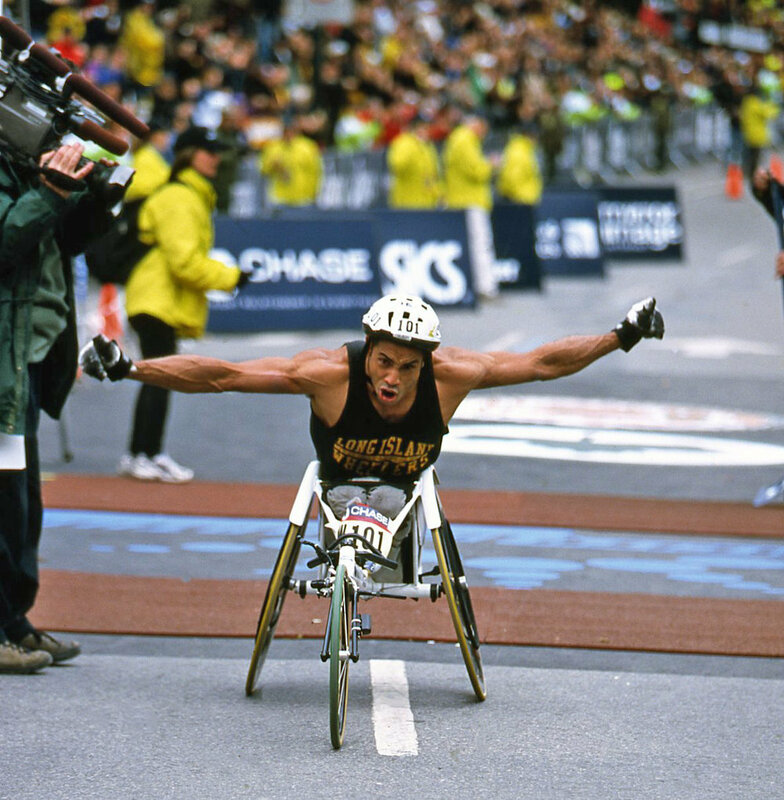 Kamel Ayari wins the men's wheelchair division at the 2000 New York City Marathon. After decades of advocating for their right to race, handcyclists and push-rim wheelchair athletes participated in the New York City Marathon for the first time in 2000. First across the finish line was push-rim wheelchair athlete Kamel Ayari of Tunisia with a time of 1:53:50. Ayari survived polio as a child and was driven by a dream that his mother had for him—to win the New York City Marathon. On the women’s side, Anh Nguyen Thi Xuan of Vietnam took the top spot in 2:46:47. New York Road Runners staged the New York City Marathon less than two months after the September 11 terrorist attacks. On an ideal day for running, multiple records fell—but the day’s story was the power of running to heal a shattered city and nation. At the start, in addition to the national anthem, an NYPD officer sang “God Bless America” and 50 doves flew into the sky. The sight of many FDNY firefighters and NYPD officers among the runners and along the course brought marathoners and spectators alike to tears. American flags were everywhere, along with I Love NY and Lady Liberty tattoos and other symbols of reverence and uplift. Spectators turned out in numbers said to be the largest ever. The race theme, United We Run, captured the essence of the New York City Marathon as a unifying force. Some runners—particularly those who had lost loved ones on 9/11—called the marathon one of the most memorable and meaningful experiences of their lives. Related: Deena Kastor on Racing the Popular® Brooklyn Half: "It's Been on My Bucket List"
When the New York Road Runners Foundation launched an after-school running program in 1999, hopes were high that the program could fill the gap left by devastating budget cuts to physical education in NYC public schools. The program grew quickly—35 NYC school and community-center sites were served in 2002–2003—and the need arose to develop funding resources to keep up with the growing demand. It turned out that a powerful solution was close at hand: a burgeoning community of runners looking to take part in premier road races on behalf of charitable causes. 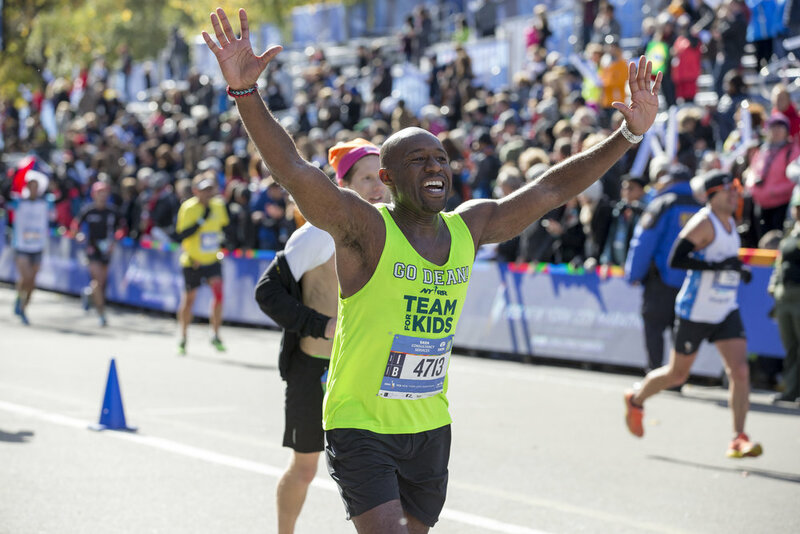 Seeing the success of Fred’s Team, which since the 1990s had been raising funds for cancer research at Memorial Sloan Kettering Cancer Center, the Foundation launched NYRR Team for Kids in the lead-up to the 2002 New York City Marathon. Team for Kids—a group of adult runners who receive guaranteed entry into premier running events and professional training support, while fundraising on behalf of NYRR youth programs—raised $130,000 that first year. To date, Team for Kids members, competing at races across the globe, have raised more than $57 million. Bolstered by Team for Kids funding and facilitated by the development of a scalable school-based model, NYRR youth programs served 112,000 kids in NYC and across the country by the end of the decade. Nine-time New York City Marathon champion Grete Waitz served as chairwoman of the New York Road Runners Foundation, which oversaw all youth and community programs and merged with New York Road Runners in 2008–09. To this day, NYRR youth programs provided free, inclusive running to kids of all abilities. Today’s programs, anchored by Rising New York Road Runners, serve 267,000 kids in NYC and nationwide. 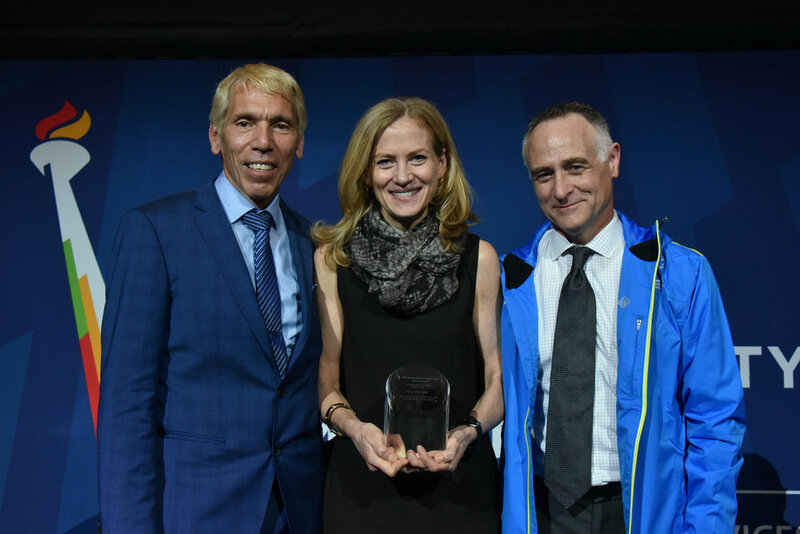 At the 2016 TCS New York City Marathon, Mary Wittenberg (pictured here with NYRR's Peter Ciaccia and Michael Capiraso) was the recipient of the Abebe Bikila Award, presented to an individual who has made an outstanding contribution to the sport of distance running. Mary Wittenberg, an attorney and the winner of the 1987 Marine Corps Marathon, had joined New York Road Runners in 1998 as the organization’s first chief operating officer. In 2005 she was named president and CEO of NYRR and race director of the New York City Marathon. Wittenberg was the first woman president of the organization and the first woman race director of a major marathon. Full of energy and charisma, Wittenberg breathed new life into the New York City Marathon, introducing split times for all runners—pros and non-elites—at the 2006 race: the start, every 5K, the half-marathon, and the finish. She also encouraged communication among race directors from the Chicago, Boston, Berlin, Tokyo, and London Marathons, and in 2006 the World Marathon Majors was formed as a points-based circuit of the most prestigious 26.2-milers in the world. Over the course of her 10 years as president and CEO, Wittenberg helped grow NYRR into the global running community that it is today. She focused on building out a year-round calendar of classes and events that helped make running more accessible for youth and adults of all abilities. George Hirsch (seated) placed first in his age group at the 2009 New York City Marathon. In 2005 magazine publisher George Hirsch became the chairman of the board of New York Road Runners. Hirsch had been the worldwide publisher of Runner’s World magazine, the publisher and president of New York magazine, the vice president of Rodale’s magazine division, the publisher of Men’s Health magazine, and the publisher and president of New Times magazine, a sponsor of the first five-borough New York City Marathon. Envisioning a race with as great an impact as the New York City Marathon and looking for a way to continue to support business in Lower Manhattan following the events of September 11, NYRR launched the NYC Half in summer 2006. The race started in Central Park, ran through Times Square, and continued on to Lower Manhattan, where 10,000 runners crossed the finish line. Today, the United Airlines NYC Half traverses two boroughs and welcomes nearly 22,000 finishers. Read more about the evolution of this iconic race. Ryan Hall runs a 2:09:02 to win the U.S. Olympic Trials Men’s Marathon in 2007. The day before the 2007 New York City Marathon raced through the five boroughs, America’s top marathoners competed through Midtown Manhattan and in Central Park at the U.S. Olympic Trials Men’s Marathon. The race served as the national marathon championship, making it the second time in a decade that New York Road Runners hosted the event, following the 2001 New York City Marathon. The Trials course started at Rockefeller Center, brought the field of 130-plus runners on a quick trip toward Times Square, and then headed up Seventh Avenue and into the park for a series of five-mile loops. Breaking away just beyond the halfway point, Ryan Hall ran a three-and-a-half-minute negative split to win and setting a new Olympic Trials record of 2:09:02. Joining him in earning spots for Beijing were Dathan Ritzenhein in 2:11:06 and Brian Sell in 2:11:40. Mary Wittenberg runs with students at a National Running Day celebration at Icahn Stadium. True to its mission to help and inspire people through running, in 2009 New York Road Runners gave people everywhere a reason to get out for a run. Partnering with other running organizations around the country, we declared the first Wednesday in June National Running Day, a day to celebrate the benefits of living an active lifestyle. Runners in the Big Apple could grab “I Ran Today” stickers in Central Park—no minimum distance or pace required. In 2016, National Running Day expanded to Global Running Day and invited people around the world to step out for a run. This year’s event will take place on June 6; learn more at globalrunningday.org. After waiting until mile 24 to make his move to the front of the pack, Meb Keflezighi went on to win the 2009 New York City Marathon in 2:09:15. Before the 2009 New York City Marathon, no American had reached the top of the podium in the open division in 27 years. 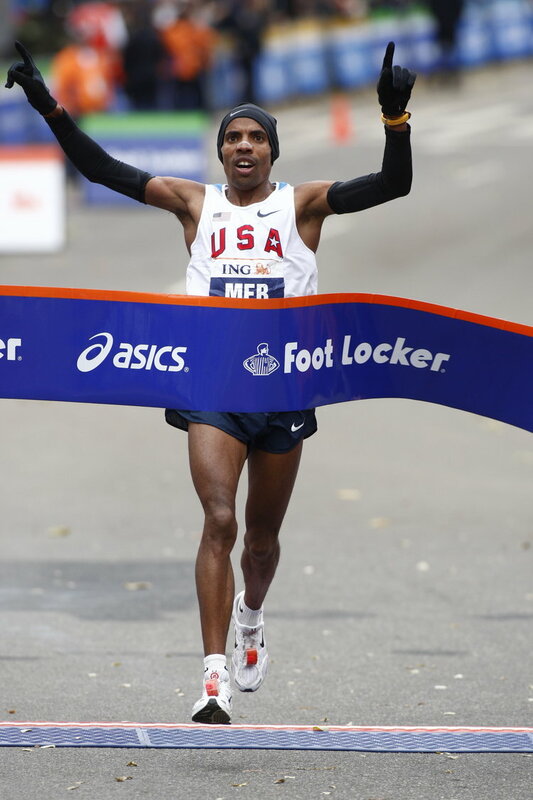 Three American men had finished second: Ken Martin in 1989, Bob Kempainen in 1993, and Meb Keflezighi in 2004. Keflezighi also finished third in 2005, but spent much of the next few years battling career-threatening injuries. Healthy again in 2009, and with the experience of four New York City Marathon finishes, Keflezighi ran a patient race on November 1, waiting until the 24th mile to make his decisive move to the front. He would pull away from Kenyan Robert Cheruiyot, building a margin of victory of 41 seconds and becoming the first American open division winner since Alberto Salazar in 1982. Read more about Keflezighi’s 2009 run, along with recaps of each of his 11 finishes in the five boroughs.